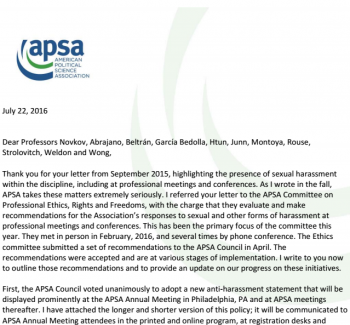 As members of the APSA Committee on the Status of Women in the Profession, we know that many women have experienced sexual misconduct, including harassment and assault, in the context of their careers as professional political scientists. We support the right of women political scientists to speak of their experiences. We deplore the harassment that thwarts women’s abilities to rise to their potential as scientists and scholars and contributes to enduring gender inequalities in our profession. The experience of harassment, particularly by a trusted teacher, mentor, or senior colleague, can reduce a woman’s productivity, deny her recognition, undermine her confidence, and limit her access to professional networks. While we recognize that each episode is unique, we are confident that our disciplinary associations, including but not limited to APSA, as well as the universities where we are faculty members, will take proper steps to investigate and adjudicate each allegation. About: The Betty Glad Legal Defense Fund was established to help women who believe they have been victims of discriminatory conduct or conditions. Members of the Women’s Caucus for Political Science who believe they have been victims of discriminatory conduct or conditions may apply for a small award from the Caucus’s Betty Glad Legal Defense Fund. The Glad Fund makes awards of up to $1,200 for legal consultation. In deciding whether to fund the applicant, the committee will not judge the merits of the case. A paid receipt from a lawyer’s office for the first visit of the Caucus member is required before the Legal Defense Fund will reimburse. The Betty Glad Legal Defense Fund pays the first lawyer’s consultation visit for WCPS members exploring a gender based discrimination suit. It is for members of the Women’s Caucus only. To be eligible for funds, you must have been a member for a year at least. Action:If you believe you have been subject to discriminatory practices and wish to apply for assistance from this fund, first please contact Dr. Laura Woliver and let her know you are going to a lawyer. Mail her the receipt for the visit, and the Fund will reimburse. Help us maintain our services: Members are encouraged to publicize the Fund at their regional meetings and to their colleagues, especially new faculty.The Fund is a 501(C)3, so tax deductible contributions are welcome at any time! Make checks out to: The Betty Glad Legal Defense Fund, c/o Laura Woliver, University of South Carolina, 425 Dean Hall Lane, Columbia, S.C. 29209. Title: Rebecca Campbell: The neurobiology of sexual assault: implications for first responders in law enforcement, prosecution, and victim advocacy. Link here! About: A very helpful and highly recommended lecture, which addresses the issue of believing a victim who has an inconsistent story, among other issues by a leading expert in sexual assault victimology.